When I went to Capital Audio Fest last year, I noticed an interesting little stand underneath a few of the bookshelf speakers at the show made by IsoAcoustics. I personally do most of my listening at a desk, whether it be my computer desk or work bench, so any opportunity to enhance that (sometimes not ideal) listening experience is very welcome. I say sometimes not ideal as with freestanding speakers or bookshelf speakers on stands you have more freedom to move them to an ideal position away from the wall, etc. and they typically sit directly on the desk, which doesn't give them any isolation. 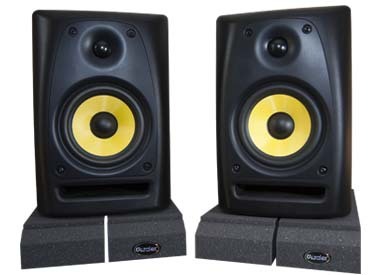 While I like my Auralex Subdude, their low-cost MoPads aren't the most attractive isolation solution for monitors. The Propads look better, but angle adjustments are somewhat limited. The IsoAcoustics stands were initially offered in plastic, which still didn't really turn any heads in my humble opinion either, however IsoAcoustics recently released the Aperta, and now the larger Aperta 200. IsoAcoustics has a nice online calculator to let you know if they'll work with your speakers. These puppies look great, are crafted of solid aluminum, have good heft and are built to last. You can purchase an aluminum platform so you can place them on top of most speaker stands too. Two of the four feet per unit are height adjustable, so you can adjust the axis of sound and get those tweeters at optimal ear level. Decoupling your speaker from your desk using the Aperta offers some very notable benefits: Bass is more punchy and less muddy and the overall sound is clearer and more dimensional. Getting the speaker away from the surface of the desk below reduces the deleterious effect of distortion caused by first reflections (Linkwitz has a great article on speaker floor reflections if you'd like to learn more). I did find that bass quantity decreased (bass generated from vibrations emanating off the desk), so you may have to turn up your subwoofer a bit to compensate if you have grown used to that level. If you are decoupling your monitors from your desk for editing purposes, you'll be getting a more accurate frequency response as a result. 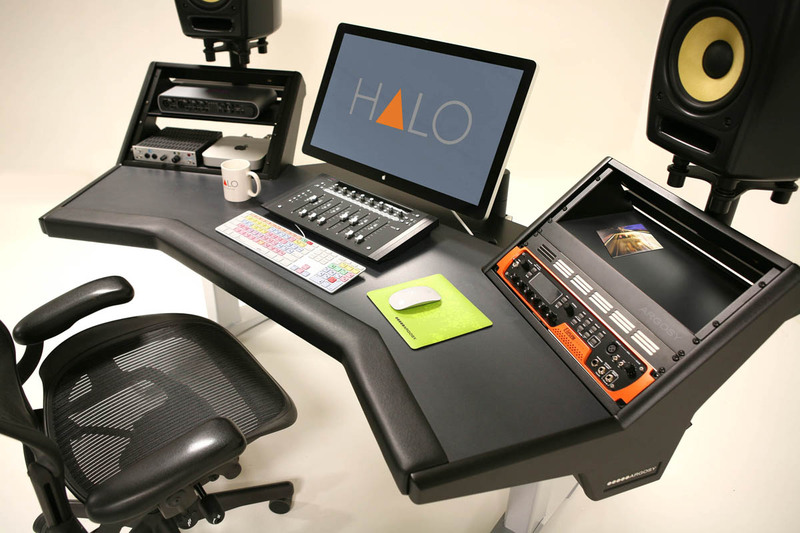 If you have a few more dollars to burn, IsoAcoustics has relationships with partner companies that incorporate their product into stands and purpose-built editing consoles. Argosy is a company that makes the latter, and man would I love to have one of these: The Halo workstation is available for $1,500-2,500 depending on the options, and while great for an editor, I could totally see this being used as a computer desk with plenty of room for amp, pre-amp, DAC and headphone amp, all at at arms length but not in the way. I hope you enjoyed the review. As always, if you are looking for a new set of cables to improve your audio system, be sure to check out Zynsonix Audio for some great solutions.